Both of these sites lie about a mile to the west of Galston, one of three towns built along the valley of the River Irvine in the north-east corner of East Ayrshire. 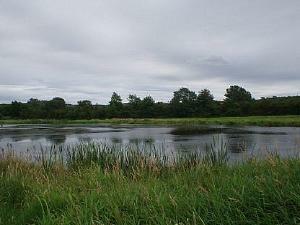 East Holmes Marsh (also known as the Grougar Marshes) lies between the River Irvine and the Cessnock Water at NS 473 72. Access is possible by parking at Hoodston Bridge, (NS 471 69), just off the busy A71 about 1km from Hurlford / 2km from Galston. You can scan most of the marsh and the surrounding area, (which floods whenever it rains heavily), by scope from the small car park or you can get closer to the marsh by carefully crossing the road, turning right and walking up the verge for about 200m to where a narrow track leads down through the fields. This track runs along the eastern edge of the marsh and offers good vantage points and plenty of cover. Reasonable viewing can also be had on the opposite side from the small track which follows the bank of the Cessnock. Ladyton or Lady Loch is found on the north side of the River Irvine at NS 486 73. It can be reached by following the unclassified road which is opposite the entrance to Loudoun Castle Theme Park on the A719, to the north of Galston. The loch is on the left hand side just past the Ladyton Farm roadend, the road here is very narrow so please park carefully. It is also worth noting that unless you are the owner of a large 4 wheel drive or a tractor you should turn around at the loch and go back the way you came – once the tarmac runs out at the farm the road gets very rough! Alternatively you can park in Galston town centre and follow the public Right of Way from the underpass at NS 499 71, up the old “coffin road” past the churchyard and onto the unclassified road mentioned above. There are a number of bus services from Kilmarnock which run past Hoodston Bridge into Galston at least every half hour. Contact Kilmarnock bus station on 01563 525192 for details. East Holmes Marsh: Car park on trunk road with fast traffic. Scan from CP with telescope. Fence prevents access to track. Ladyton Loch: View from car at side of road. Road rough and unsurfaced in places. Access to marsh along A71 is not recommended. Ladyton Loch is accessible along quiet byway. East Holmes is particularly good for waders on passage in the spring and autumn – Snipe , Redshank , Common Sandpiper , Curlew and Oystercatcher are all regular visitors. Other less common birds such as Green and Wood Sandpiper, Little Egret and Ruff have also put in appearances in recent times. Breeding birds at the site include Grey Heron , Water Rail , Grasshopper Warbler , Reed Bunting and Little Grebe . In winter the marsh holds a good range of ducks: Teal , Mallard , Wigeon , Pochard , Gadwall and Tufted Duck can all be seen. Ladyton Loch is quite small but is worth a visit if you are in the area. Little Grebe , Mute Swan, Moorhen , Teal and Mallard breed on the site and there are always Whooper Swans and other wildfowl in the winter. The surrounding marshy fields, scrub woodland and hedgerows are also good for birds Breeding species include Lapwing , Grey Heron , Oystercatcher , Bullfinch , Reed Bunting , Yellowhammer and Sedge Warbler . The Ravens from nearby Loudoun Hill have also been seen on the track beside the loch! This stretch of the River Irvine has a Sand Martin colony and breeding Dipper . Kingfisher can also be seen. This entry was posted in Locations - East Ayrshire on 28-Jan-2003 .